The eponymous owner of Miles Griffiths Antiques was born in 1970 and raised in a country house in Lancashire. Here, his parents’ eclectic interiors undoubtedly stoked his interest in antiques and design. Trained yet bored by his textile design degree, Miles moved on and with his mum, established a local retail emporium. He supplied antique props for the shop floor, which gained interest and attention from members of the public. This was the beginning of Miles Griffiths Antiques. Opening his first antiques shop, Miles quickly gained a local fan club; he’d often return with his wares to find queues waiting for their next antiques fix. Later, having outgrown the shop, Miles dealt primarily with the antiques trade at fairs. This meant very early morning starts and he was soon travelling all over the country. He established a following on the circuit as a reputable dealer with a superb eye for the decorative and unexpected. 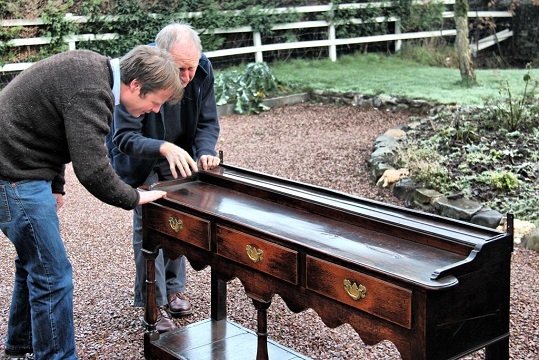 Now in its 28th year, Miles Griffiths Antiques is a friendly, family run online antiques company with Miles’ wife Rebecca and good friends, Mark and Simon on board. Miles and Rebecca’s children, Maisie and Sandy often help out in the holidays, along with Miles’ faithful canine companions Alf and Sprout, who appear in many of the website images. 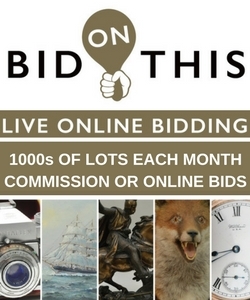 Miles deals mainly in English antiques from the 1700s to the best 20th century designers. We persuaded him to take a little time out to talk about his life in the trade and share some of his best-kept secrets. The antiques trade is vast, but selling well for us at the moment are very original pieces, that have had a good life and not been messed around with, such as Georgian antique pine furniture in the original paint, good quality upholstery and large scale, antique storage pieces. What do you think are the current ‘good investment’ items – ones to watch? If we knew the answer to that, trading would be easy. A safe bet, though, are items by good English makers and ones to watch, maybe 1930s-40s art works that will be coming up to being the old saying of ‘antiques have to be a 100 years old’. What antiques do you have at home and why? I think all dealers will say this: ones we cannot sell! I naturally buy items that might not be so ‘current’ and in vogue, so by the time I do sell anything from our home, they have usually caught up. I like to keep one step ahead! The antique trade in the future will be pretty much the same. We all work hard, unsavoury hours, but generally, I think we all enjoy it. It is a great trade to be in, but you have to love it with a passion. The antiques trade has changed dramatically in the last 10 years, so I think it will calm down a little over the next ten. Online trading is huge now and the day of the shop is over, people say, but I do think things will come full circle at some time and we will all be wanting an antiques shop again, but only if the business rates are cheaper! 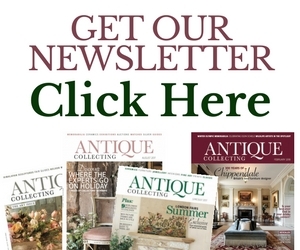 Tell us some trade secrets – what are your top tips for buying antiques? My top tip for buying an antique is, buy from a dealer/company you trust and that you can talk to and build a relationship with. Even if they don’t have want you want, they might be able to point you to a fellow dealer that has just what you are looking for. Definitely, no doubt, a painting or two by Ivon Hitchens. Maybe a nice bit of treen or a country stool. Where are your favourite antique hunting destinations? I don’t have any specific hunting grounds now, as a lot of them have now closed. I just have to spend a lot of time on the road sniffing items out and too much time on the phone! Buying items that don’t suit their style of their homes, and furniture that is too large or too small for the space. What key questions should buyers and collectors ask before buying? I have asked Rebecca, my wife, who runs the Miles Griffiths antiques office this question, she says: Ask if the piece has been altered? As so many antiques have been. Is it fit for use? Because most people do want to actually use furniture, not just look at it. And most importantly, if buying online, can I return it if I am not happy with it? What is the appeal of antiques in modern interiors? Antiques have always had appeal in modern interiors, they just add a little extra dimension to them, depth, interest and warmth. We deal with interior designers that start off with antiques first, then build the room around them. Why should people buy antiques over new items? People should buy antique over modern pieces as they are usually superior in quality, built to last and, most importantly, a lot better value. And I am very proud to say, that I have never visited an Ikea and that word is banned in our household! 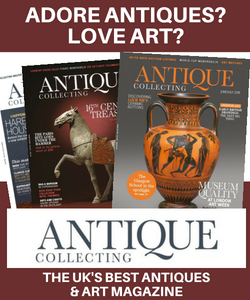 Do you think young people are interested in antiques and, if so, how do they appeal to them? We have a lot of young, professional people buying from our antiques website. Some have been with us for years, filling their homes and have become good friends. Apparently, in one of the BBC offices, we have become there cheeky go-to website when they are bored with work! Generally, though, I think if the customer is a little more individual and would like a unique interior, then antiques are the perfect fit.